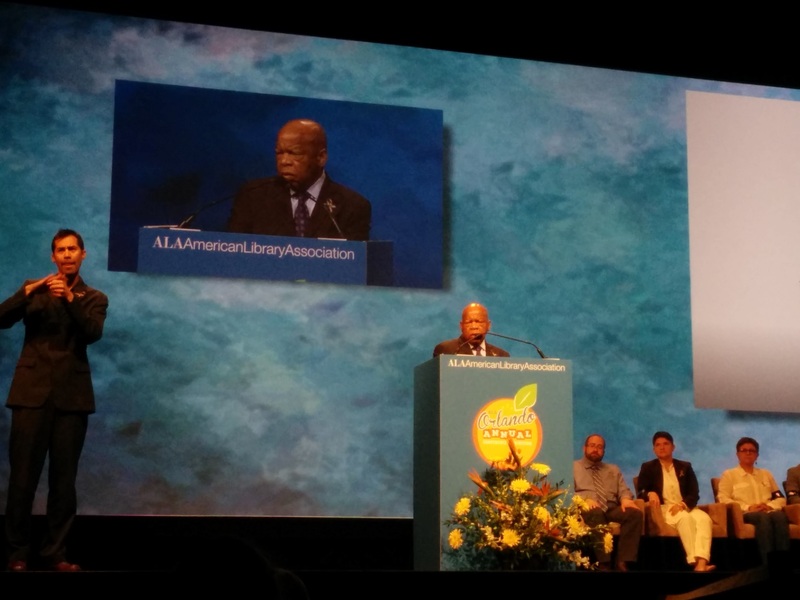 When it dawned on me that attending the American Library Association’s 2016 Annual Conference meant that I would be in Orlando not even two weeks after the massacre in Pulse Club, I felt a sense of powerlessness and loss. Was there something I could do to make it clear, at least to myself, that I mourn the victims (not just this year, not just the LGBTQ+ community, bur all innocent lives lost to the easy accessibility assault weapons)? Was there some way to mark the weekend in some small ways to remember the victims and to remind all those around me to continue fighting for gun control? When ALSC (Association for Library Services to Children) president Andrew Medlar posted on the members listserv that there was going to be a Memorial Service for Pulse Victims, along with other volunteer opportunities, I felt so grateful. Thanks to ALA’s GLBT Round Table for organizing this memorial, I could at least show my respect and support for the causes. 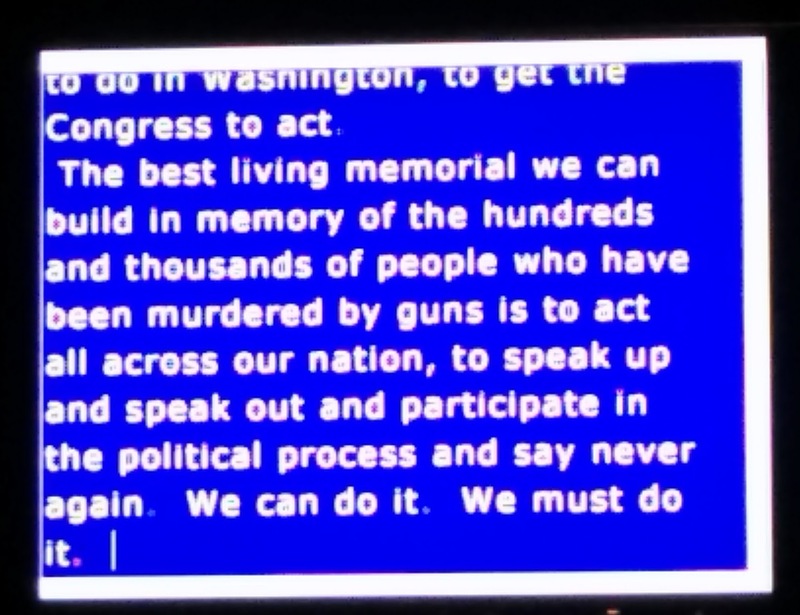 Saturday, June 25, at 8:00 a.m., hundreds gathered in the convention center’s Chapin Theater – we listened to impassioned speeches about the work still needs to be done, including a short talk delivered by special guest Congressman John Lewis. His powerful remarks reminded all of us the importance to ACT. We then stood in silence when all 49 names scrolled on the large screen — reminding us how many of them were so young and how many of them were of Latino heritages. As a community of librarians whose goals are to better our communities with literature, literacy, and community activism, the words I heard from the GLBT Round Table chairs (both present and former) at this memorial strengthened my conviction and commitment to continue such work as a member of the Round Table. 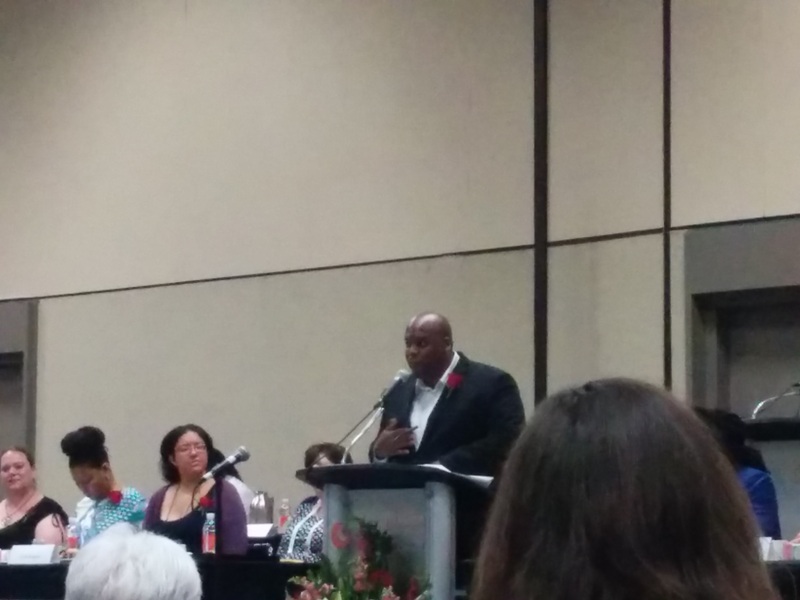 I also belong to another Round Table at ALA: EMIERT – Ethnic & Multicultural Information Exchange Round Table which administers the Coretta Scott King Book Award each year to “outstanding African American authors and illustrators of books for children and young adults that demonstrate an appreciation of African American culture and universal human values.” Every year, during the Annual Conference, the CSK Award Breakfast on Sunday (at 7:00 a.m.) is always a rousing, powerful, and moving event. I look forward to it and always know I will be in the strong embrace of like-minded librarians and book makers and will be exposed to significant speeches. This year was no different. Rita Williams-Garcia, Bryan Collier, Ronald L. Smith, Ekua Holmes, Jason Reynolds, Brendan Kiely, Ilyasah Shabazz, Kekla Magoon, R. Gregory Christie, Christian Robinson, and Jerry Pinkney for Virginia Hamilton Lifetime Achievement. Each speech was different, some humorous, some somber, yet all were true and inspiring. Many young folks were in the room and I saw their heads bobbing in agreement throughout the speeches, affirming the power of words and the promises to keep doing important work. I teared up multiple times: of course, that’s not a unique phenomenon. I attend the CSK Breakfast to celebrate and to have a good cry and to renew my faith in advancing equity and social justices through the power of literary works that channel the power of their creators. But this year, there was also the un-prepared and oh so smooth and sincere speech by Jason Reynolds, a love song to his mother, who was IN THE HOUSE! And the exhilarating, eloquent calls to action by Ilyasah Shabazz, daughter of Malcolm X. Ronald Smith’s reminder that not all African American authors must or do write about realistic, historical, African American lives but they should own the full range of literary genres and themes, fantasy, science fiction, and beyond. Christian Robinson’s love for his Nana was evident; Kekla Magoon’s sense of responsibility was energizing; Ekua Holmes is not only a wonderful artist, but an impressive public speaker — I can’t wait to hear and see more from her! I wish everyone could have been there listening to Bredan Kiely’s on-the-verge-of-tears-oh-no-I’m-actually-sobbing-as-I-lisetn-to-this highly self-aware and conscientious white, sis-gender, straight, privileged male (as he declared in his speech for All American Boys, co-authored with Jason Reynolds) author whose heart is on his sleeve and who shares his vulnerability without qualm. (Have you read Gospel of Winter yet? No? Go get it! It was the 2015 Top 10 Best Fiction for Young Adults!) I really would love to see all of the speeches in print somewhere (since Horn Book only publishes the winners’ speeches). Here are just a couple more snapshots of that auspicious morning which will forever imprint in my mind, same as last year and all the years before. Thank you, Roxanne. Beautifully put. I, too, long for videos of those speeches. Well said, Roxanne! The CSK breakfast is also my favorite ALA event. I had to leave a little early to get to my own presentation — I missed Jerry Pinkney’s speech — but was grateful once again for the opportunity to attend the event. 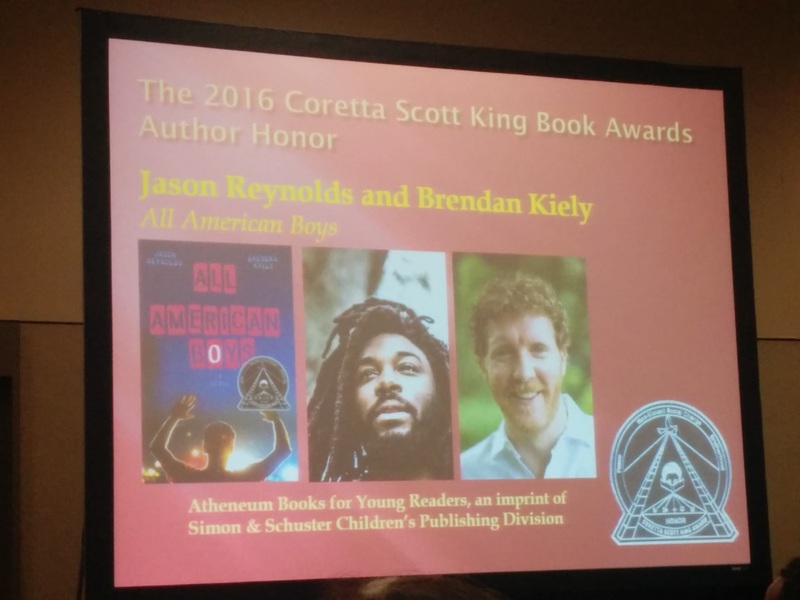 It’s encouraging, too, to see the increasing amount of crossover between the CSK and Newbery/Caldecott awards. And on another diversity front close to my heart, the crossover between the Schneider and Newbery. I’m looking forward to your Recap, Part 2! Perhaps because it is a private link only to friends? Hmmm… why didn’t the link include in my last comment? Sam, I inserted the link with an image directly to the post. Thank you so much for directing me to the facebook page – and thanks to Patricia Enciso for capturing and sharing this! Excellent, glad to direct more people to this AMAZING speech! Thanks for providing the links here!